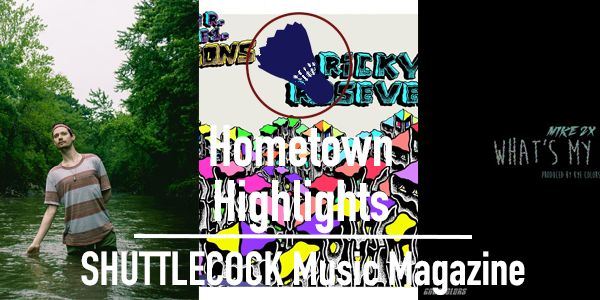 Welcome to the first Hometown Highlights of June. We have new songs from Kansas City and Lawrence rappers, a wild new Lawrence math rock trio, Kansas City rockers (stoner and psychedelic), and a strange new local producer and singer. As always, something for almost everybody. Click a track and read up! The Philistines - "The Accretion Disco"
Since the group's inception in late 2013, The Philistines have been gigging locally and regionally with remarkable consistency. After becoming live veterans, their debut album, "The Backbone Of Night," was finally released late last month on The Record Machine. The album is a massive-sounding 42 minutes of rock music that makes the wait quite worth it. While the album undeniably packs a punch, bits and pieces do end up sounding reminiscent of run-of-the-mill 2000's radio rock -- but perhaps on steroids. The more enjoyable parts of the album are the spacey, psychedelic rock jams like the eight-minute long "The Accretion Disco." Speaking of long rock songs, Wides has another one for you. "Day2" is the first recording released by the Lawrence three-piece. This twelve minute odyssey consists of math rock grooves, blasts of punk rock energy, and a solid two lines of lyrics. Check out one of Lawrence's most promising new rock acts quick, they might release another song by the time you finish this one! Mike 2x - "What's My Name"
I'll be straight with you: I was late on this song. I needed to spend some time with it. Kye Colors produced this track for his friend Mike 2x; you can tell by the lurching bass lines that Kye loves to utilize. The thing that threw me off initially was Mike's flow near the beginning of the track. It sounds off-beat at first until you notice that the beat is just that complex. Although he has released music and appeared on other songs before, this song serves as an excellent introduction to the young rapper. In case you didn't know: "It ain't 2x spelled 'two times,' but it's 2x spelled '2-x'/First Kye had to get it right, then I had to get my groove back." "Double R. Volume 1. Visions" is the title of Ricky Roosevelt's first full-length release. The Lawrence-based Vivid Zebra member is one of the college town's most unique rhymers. On "Matrix" Roosevelt emulates the flows of Captain Murphy and Vince Staples over electronic-tinged cloud rap instrumentation. Basically, if you're a fan of the song "Between Friends" by Flying Lotus, you might dig this. While not every line lands gracefully, Roosevelt shows a great deal of ambition and vision moving forward. Chasm - "Programmed 2 Kill"
Couldn't get enough of Chasm's demo last year? You're in luck. The Kansas City trio just released "Demo II: Demolition" and they picked up right where the first left off. "Programmed 2 Kill" is the closing song on the tape and perhaps the most grim work the group has concocted yet. If you like your rock evil and stony, this one's for you. "Waterbed" is the opening track to Jipetto's album of the same name. While not officially released by the label, the album received a co-sign from Intelligent Sound after Jipetto appeared on their last compilation. "Waterbed" is a lush ten song effort full of smooth vocals and a strange mix of electronic instrumentals. Some tracks near ambient territory while Jipetto can be found rapping on others. "Waterbed" is a fitting introduction to a very intriguing debut release.